Thermal breaks make such a huge difference. I HATE that Perma R crap. 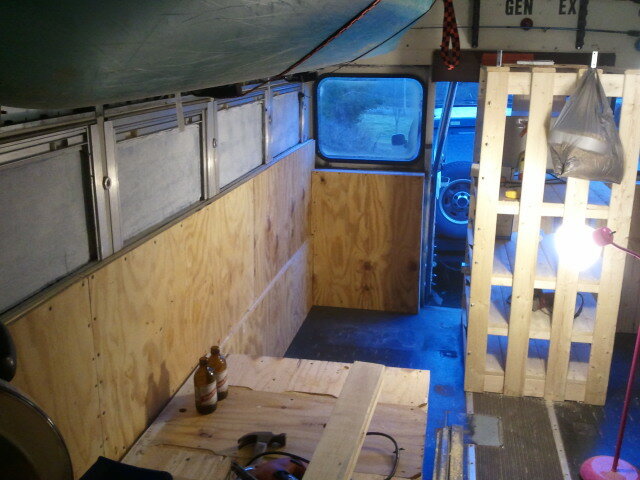 We have to buy some more this weekend to do more to the interior walls. Not any choice really here. 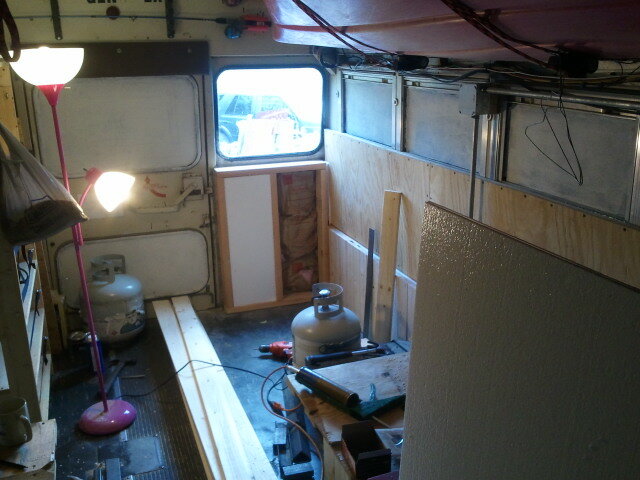 I'm going to have those lousy Styrofoam beads all over until we get the interior sealed up (soon, soon!). There's just so much static electricity too! Little Styrofoam beads stuck to everything including ME! I will just deal with it (and vacuum a lot). David's got the bedroom and toilet area furred out. The toilet area gets the last of the pink Foamular because it's such a small amount and I intend on using the freebie pegboard we have to cover the sidewall with. I need to buy some pegboard fittings. HD has a set of three baskets that hook into pegboard. I need something to hold our tooth brushes (screwdriver holders), David's electric razor (small basket) and a few things that are currently sitting on the vanity countertop. 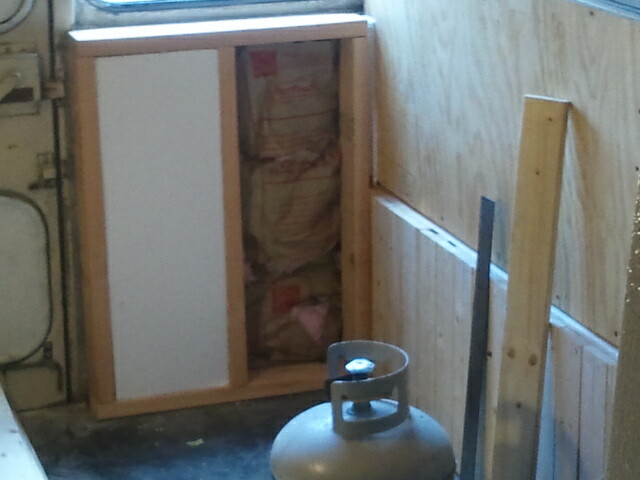 I need to cut and fit the toilet room insulation today. Awesome. Did you skin the windows? Nope CC, we wanted to keep the ventilation so all windows will lower to the non installed sill pc. I just needed to insulate the damn microwave ovens called "black windows" even at 19* the sun hitting the blacked out windows was hot as heck. Since we both hate or loathe...nagh we hate cold weather the warming effect will be so not missed in the other. 8 months. I was comparing some samples from last weekend,when the guy said "you need some help?" The guy at lowes said "hell I can cut it 2ft wide and we can roll it short side, so it can be put in your truck and not on top with snow"
So I needed 22.50 in and he cut it at 32-ish. he smiled "well...I cant sell that"...so 7 feet or so later(i havent measured it yet) I had my 2 pc of carpet that equaled 4 feet!!!!! first pc cutting to fit...exactly what in the hell is best way to cut this crap?new razor, so so pulls yarn.Kitchen shears(dont tell Lisa)..my hand is sore and sooo,sooo....a combo of both seems to work best. ...exactly what in the hell is best way to cut this crap? Sharp razor, cut thru the jute backing from the backside of the carpet using a progressive "sawing" method. Use scissors to cut the "stringy" stuff (looks like plastic ribbons). Change blades often. This is the method that I have found that works best for me. I dislike cutting carpet! I don't care much for carpet either. I'm going with Commercial Tiles on the rubber floor once we finish the interior. Then I'm going to put some floor runner carpet down as "throw away" rugs. When they get too dirty, I throw them away. HD has some "binder" material that you glue to the cut edges for a finished edge (kept next to the rolls of cut-to-length carpet runners).